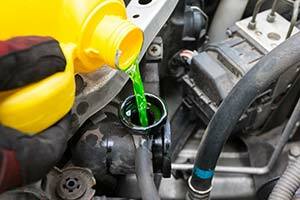 Your vehicle requires a number of certain fluids to keep it running smoothly, a few examples being engine oil, brake fluid, power steering fluid and one we will be focusing on in this article: engine coolant. If you want to discover what fluids you need to regularly maintain for your vehicle to remain healthy, check out our article: Maintain These 6 Fluids To Keep Your Vehicle In Good Condition! What Does Engine Coolant Do & Why Is It Important? Engine coolant is generally a 50/50 mixture of water and antifreeze and it is stored in the radiator. You might be thinking, water should be cooling enough on its own, however, antifreeze actually has a lower freezing point and a higher boiling point than water. So, when it comes to the different weather conditions, water would eventually evaporate in high temperatures or freeze in very low temperatures, whereas antifreeze wouldn’t and thus would provide more protection to your engine. Nonetheless, there’s a reason why there is a 1:1 ratio of both fluids, as both work together to form the most effective cooling system for your engine. You’ve probably already guessed what engine coolant does, but let’s clarify its role just in case you’re confused. Essentially, this fluid has the job of maintaining the temperature of your engine, ideally allowing it to run at the optimum temperature. Without this essential fluid, your vehicle’s engine would quickly overheat and this would result in engine failure. In the engine, heat energy produced from internal combustion must be dealt with immediately, as detrimental effects would follow if it was left to build up, which is why a cooling system is vital. Engine coolant is transported around the engine via a water pump. It absorbs the surplus of heat energy produced and delivers it to the radiator, where the heat energy is dispersed, thus, in turn, the water cools down and is carried back through the engine to repeat the process. How To Check Your Engine Coolant Levels! If you’ve ever carried out a brake fluid check or engine oil check, then this process may seem familiar to you! Firstly, ensure your vehicle is parked on level ground so that you can accurately measure where your engine coolant level is. Make sure you are not checking just after the vehicle has been running for some time, as the fluid becomes pressurised when the engine is running, so removing the cap in this scenario will result in a burst of hot water escaping and possibly burning you. Now just pop the bonnet open and you’re ready to begin. Okay, it’s time to locate where the engine coolant reservoir lies, so consult your vehicles handbook and see if you can find it in the engine bay. Once you’ve located the reservoir, observe the maximum and minimum marks on it, which will reveal the limits of which the engine coolant should be within. You can use these parameters to check how much engine coolant is in the reservoir and whether more needs to be added or not. If you notice that there seems to be too little engine coolant in the reservoir, you will need to add some to bring the level back up. Note: Your coolant level shouldn’t just decrease for no reason, so it’s best if you get your car booked in with a mechanic to ensure that everything is in working order and that there are no leaks. How To Top Up Your Engine Coolant! Assuming you’ve concluded that more coolant needs to be added, due to the levels falling below minimum, before thinking about starting this process you need to ensure your engine has been off for a while. Additionally, you need to have the correct type of coolant for your engine, so if you’re unsure of what that type is, consult your owner’s manual. Once your engine is cool and you have the right coolant, you should remove the cap from the reservoir and add however much is needed (up to the cold fill line). Place the cap back on, ensure it’s securely tightened and close the bonnet. Job done! Why & When Should You Replace Your Engine Coolant? First of all, let’s discuss why you need to change your coolant. Over an extended period of time, your coolant may begin to lose its effectiveness, due to the fluid getting contaminated and breaking down. If you leave the same coolant mixture in the radiator for longer than it should be left, you’ll probably find rusting in the passages of the cooling system and on the radiator, due to the components in the mixture that hinder corrosion not working anymore. If the internal components of the cooling system rust, it will result in blockages, meaning no circulating coolant, the consequence of an eventual engine fail and some pretty hefty repair bills. Now on to when it should be serviced. If you check your owner’s manual, you will find out the replacement intervals required for your vehicle’s engine. However, if you get into a regular routine of checking your engine coolant and one day you notice that it looks cloudy and contaminated, then that may be a sign that you need to drain it and replace it with some fresh coolant. Also, if you notice a build-up of a creamy/yellowy looking gunge around the coolant filler cap, or the smell of exhaust fumes from the filler bottle, it could be a sign of the engines head gasket failing. If you feel your engine coolant has seen better days and it may be in need of a service, contact Sinspeed today! We offer an engine coolant service as part of a major service, or it can be done separately, so book your vehicle in with us as soon as possible! Tags : Engine Coolant Guide, Guide On Engine Coolant, How To Check & Change Engine Coolant, How To Check And Top Up Your Engine Coolant, How To Check Engine Coolant Levels, How To: Maintain Engine Coolant.